Looking for a gift for the young toddler in your life? Wondering what the best toys are for 1-year-olds? Past the age of 12 months, toys become more diversified and should help your little one reach his or her developmental milestones. Understanding your child’s progress is important in picking the most adapted toy. After discussing typical milestones reached by a 1-year-old, I’ll then share with you my selection of the best toys on the market. Let’s get started. Use the links above to check the latest prices or read our in-depth 1 year old toy reviews below. Babies might not seem to do much during the first year of their life, however, their brains are developing at a rapid pace and learning is continuous. When they hit 1 year, they kick it into high gear. Gross motor skills: By this age, most babies are crawling and some may be taking their first steps. Because they’ll start scouting on their own, it’s important to ensure your home is childproof (source). Fine motor skills: Their little fingers should be able to turn the thick pages of a kid’s book. A 1-year-old will also attempt to eat on their own and try to hold and use objects, such as a hairbrush. Cognitive: By 12 months, a baby’s brain has doubled in size (source). They’ll understand an object can be thrown or dropped and will be more than happy to test your limits. They begin to imitate adults and should be able to play hide and seek. Language and communication skills: At the age of 12 months, a toddler should start understanding you. They are also becoming aware of their surroundings and may pronounce their first words (source). 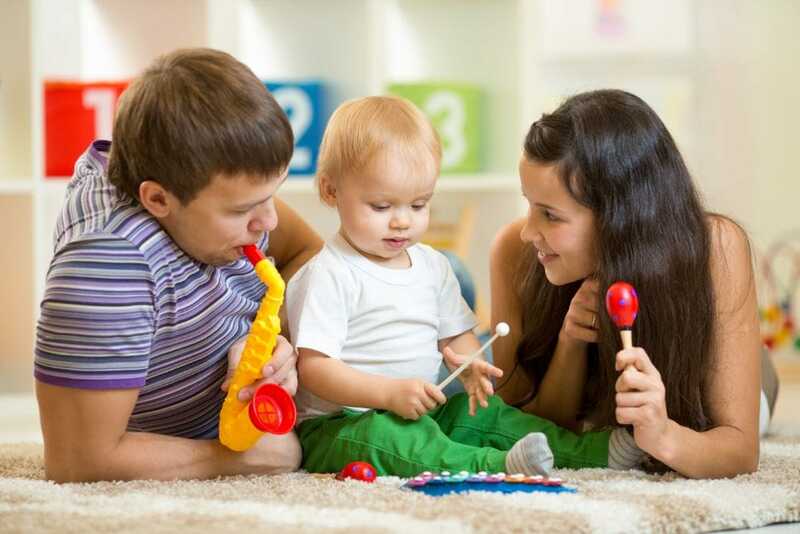 Besides selecting a toy that will help your little one reach his or her developmental milestones, here are a few other things to think about before choosing. Safety: At this age, kids tend to explore the world around them via their mouths. Because of this, products suitable for 1-year-olds shouldn’t contain small pieces, due to the choking hazard. 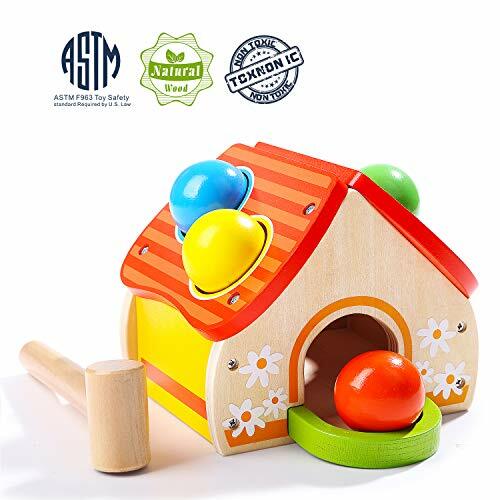 Material: Most toys are either made of wood or plastic. Wood is usually sturdier but often comes at a higher price point. Plastic is lightweight but less durable, and it can also contain harmful additives, such as BPA. Toys that grow with your kid: Toddlers grow fast and their abilities evolve rapidly. Investing in a toy that could remain with your little one for a few years might be preferable. Being a parent is a huge responsibility, and finding the proper toys can assist you in developing your toddler’s skills. Whether you want to help them develop their fine motor skills or become more coordinated, we’ve got you covered. Boys or girls, every child seems to go through a dinosaur phase. At this stage, any dinosaur-related toy should guarantee excitement. 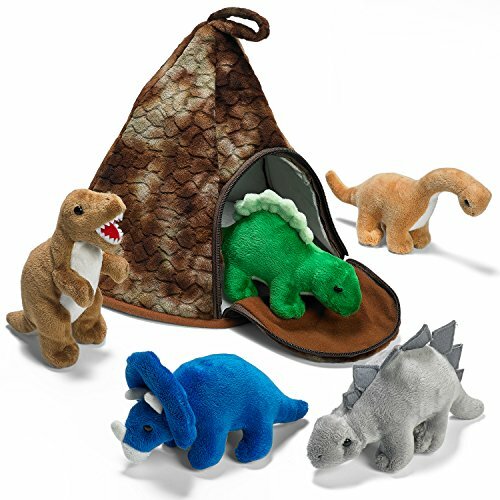 This volcano house is home to five plush dinosaurs and could be the root of the most creative playtime. The open volcano becomes a refuge for the dinosaurs. Young toddlers should have an easy time taking the dinosaurs in and out, working on their coordination skills. Once safely zipped inside the volcano bag, a convenient handle makes it easy to carry to grandma’s house. It’s also easy to store until the next use. 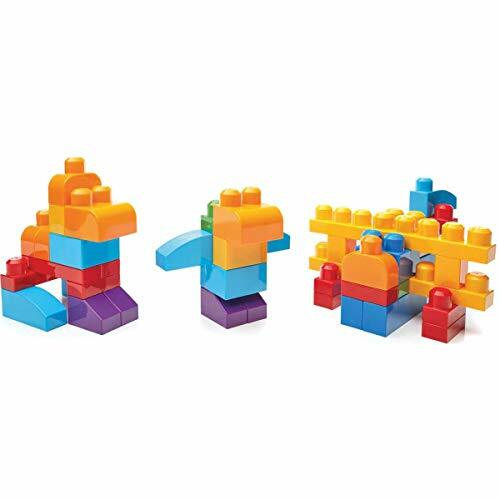 This popular toy is the ideal first set of building blocks for your child. Composed of a variety of bright colors, you’ll be able to introduce your little one to the spectrum, including red, yellow, purple, and more. Blocks don’t only come in the standard rectangular shape. These blocks will take the challenge to the next level and allow your child to build the most innovative towers. Designed to fit small hands, this toy should help your toddler develop fine motor skills. When it’s time to pack up, all 80 blocks nicely fit in the included bag, for easy storage until next playtime. This outdoor swing should entertain your 1-year-old for a few years. Made in the United States, the secure straps and “t-bar” will comfortably but securely hold your child while swinging. This swing can safely hold kids up to 50 pounds, making it suitable when your child grows older, too. Simply rotate and attach the t-bar underneath the seat with the straps. Hooks are included, although this set doesn’t include any other mounting hardware, such as anchors. A classic choice for timeless fun, your child will enjoy many happy hours of fun with this swing. This ride-on toy combines four types of rides in one tricycle. It can be used as early as 9 months old and should be able to follow your child’s riding needs for the next few years. As your toddler is mastering his or her gross motor skills, a parent handle can be used to assist your child while pedaling. A high backrest and 3-point harness will keep them safe. If they’re still too small to reach the pedals, they can place their feet on the footrest. During break time, a tray is available to place toys and a drink, and a removable canopy will keep your toddler in the shade. As your child grows, the footrest, adult push handle, and tray can be removed to create a real tricycle. A small storage bin is located in the back for any on-the-go necessities. Having a hard time getting your little one to take a bath? This bath toy set might require good negotiation skills to get him or her out of it! These eight animal toys are designed to perfectly fit small hands, for strong grip and squeeze. 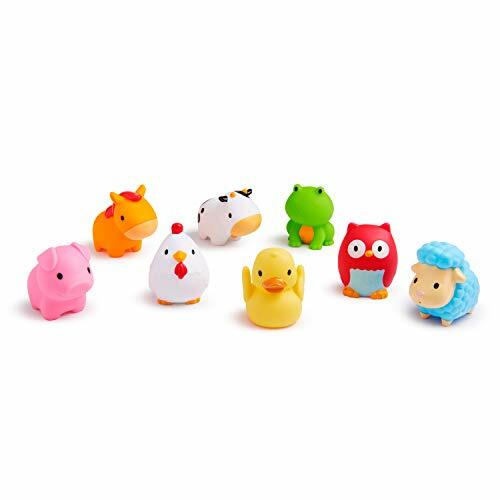 A sheep, cow, horse, duck, frog, pig, chicken, and owl can make bathtime not only full of laughter but educational as well. Promoting pretend play and fine motor skills, this toy set should make both mom and baby happy. Made of high-quality and child-safe materials, they’re super cute and ready for some barnyard imitation sounds. Grabbing a ball might not appear like a challenge for adults. When it comes to tiny 1-year-old hands and fingers, though, it can become a frustrating experience. This ball is covered in colorful, multi-textured patterned “bumps,” stitched on the outside of the ball. They make it easy to grab and throw, developing fine and gross motor skills. Two rattles make a gentle noise to keep your child engaged and entertained. Small in size, it’s easily transportable and can be conveniently used during travels. We appreciate the variety of tactile experiences this ball offers. This toy isn’t a simple decorative plush. The cute octopus has a bit more under his belt than that. 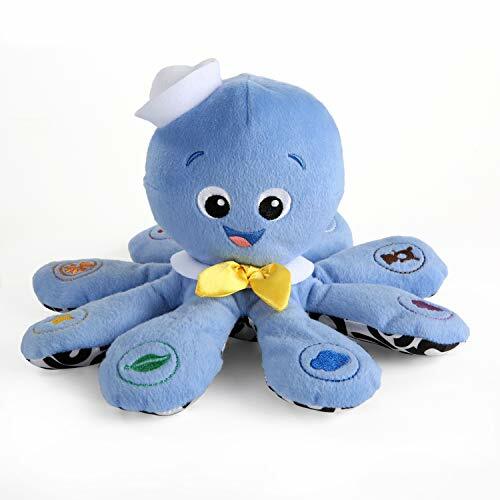 With the help of a gentle squeeze on any of the legs, the octopus teaches your child colors, not only in English but also in French and Spanish. By pressing its head, classical music will play. To complete the learning process, each leg features an embroidered object of the given color. When parents need some quiet time, volume control can be used. If your little one grows fond of this cute octopus, its compact size makes it easy to tote around. This multi-functional musical toy should captivate and distract your child in a few ways. Hammering the balls, your little one will be able to create musical melodies. The toy will also get your child running after the balls, providing physical exercise. 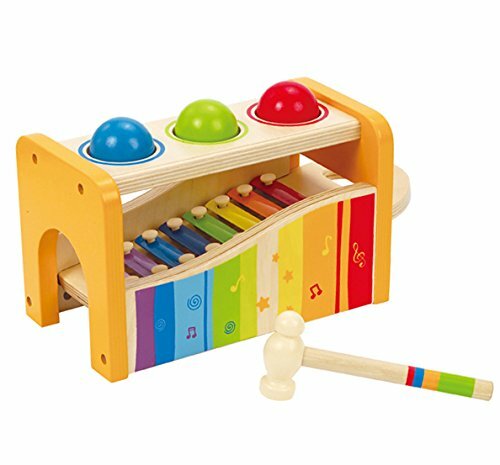 The removable xylophone can be used separately, to play customized melodies using the individual notes. Built with safe, round edges, this non-toxic toy has won several awards, making it one of the most popular toys in its category. Bedtime reading is a special time for parents and toddlers to bond. The thick pages of this book are easy to grab and turn, even for the youngest hands. Each of the three tabs displays cute characters, lighting up as they’re pressed. They also play melodies and pronounce animal names, sounds, and other simple words. 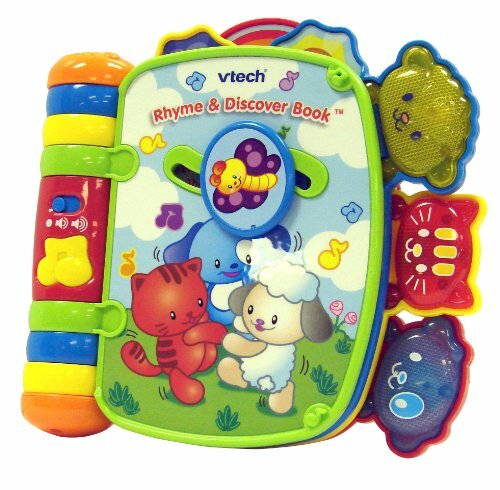 This sturdy electronic book is made of high-quality plastic and designed to withstand rough play. Parents might enjoy the volume control and automatic shut-off features. 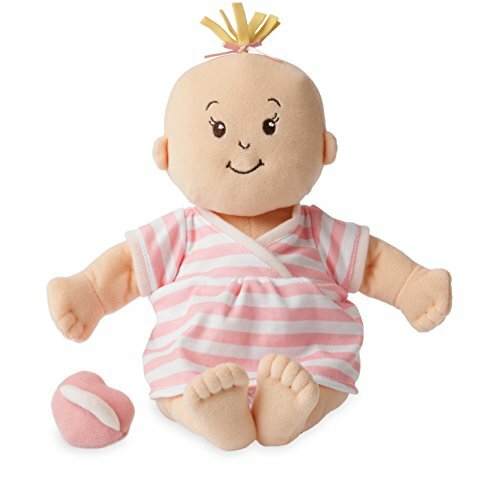 This soft doll should be perfectly safe for 1-year-old toddlers. It even features embroidered details of a real baby — belly button, toes, and fingers. Your child should have a great time pretending to nurture his or her little one, acting like mommy. A two-piece outfit can be easily put on or removed, and the magnetic pacifier makes role play more realistic. Although the baby doll isn’t machine washable, the surface can be easily wiped clean. First steps aren’t easy to take, and a little extra help can build self-confidence. This push walker is made of sturdy wood to handle your kid’s first steps. Your little one will be able to hold on to the handle and wander around on their own, even though it might take some time adjusting. As your child walks around, three alligators open and close their mouths. Four fish — located on each spinning wheel — are trying to escape. When a break is needed, your child can sit down and play with the wooden insects that spin round on a pole. 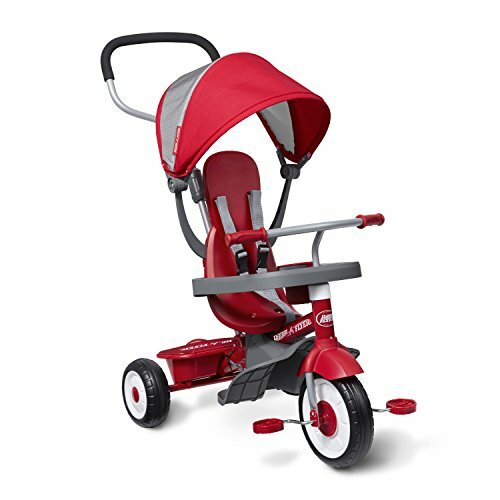 Built with non-skid wheels, your toddler is able to safely walk at a steady pace, without leaving marks on the floor. Going to see grandma, go grocery shopping or heading for a family vacation? Keeping our toddlers entertained while on the go isn’t always easy. For some unknown reason, buckles seem to fascinate most children. 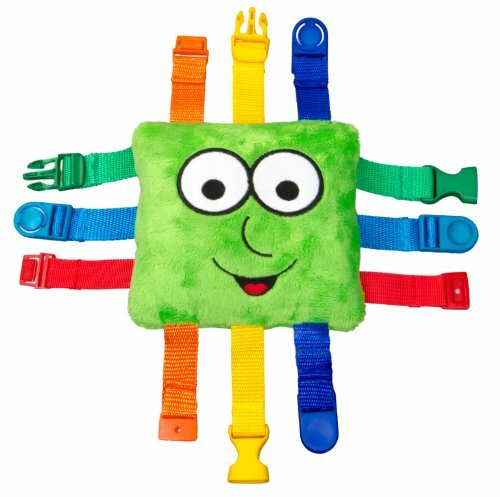 This soft and colorful traveling toy features six bright and matching belts to keep your little one busy buckling. A happy face is embroidered on one side, and numbers on the other side. 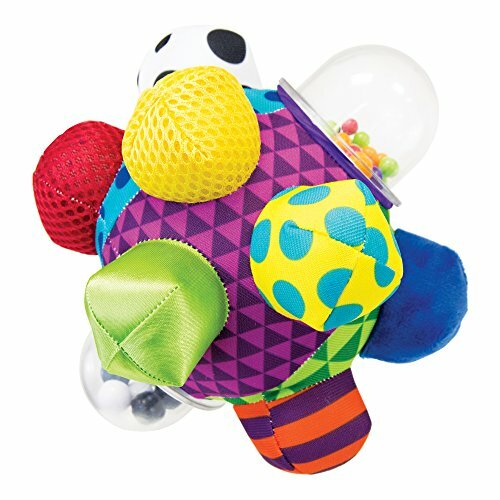 Inside, a zipper makes this traveling toy a great hiding place for small toys. Looking for the best educational toy that combines multiple developmental milestones? This wooden cube gathers five activities to keep your child entertained while learning. 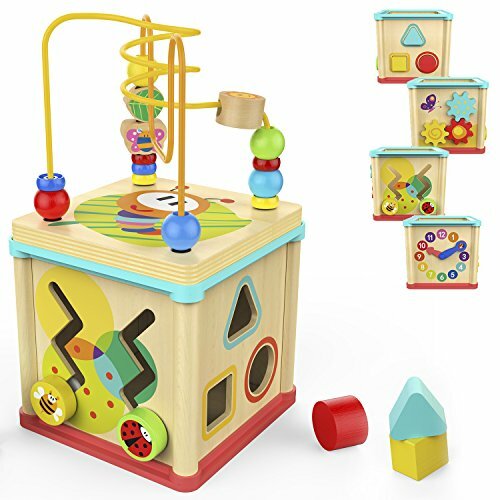 It features a beads labyrinth, a clock with movable indicators, shape sorter, zigzagging bee and ladybug, and spinning tools. These activities are designed to enhance your child’s logical thinking and coordination, among other benefits. It’s also made with non-toxic paint and has round edges to avoid injury. When it’s time to put the toy away, the labyrinth easily stores in the box, saving space in your child’s room. For a successful day at the beach, sand toys are essential to keep a toddler entertained. 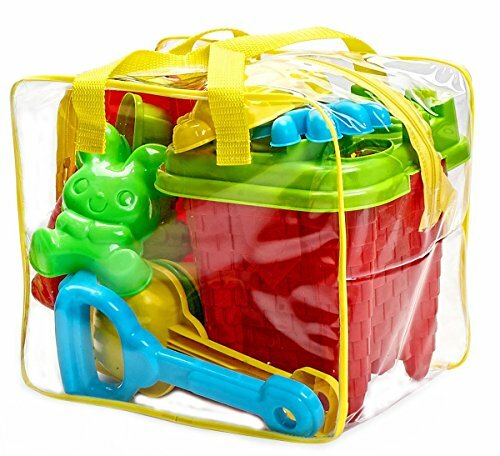 All in all, there are 15 pieces included in this set, which comes complete with its own storage bag. This set contains tools that are easy to grab, even for 1-year-olds. It also includes more advanced tools, such as molds for construction. As your kid grows, the castle bucket should make beautiful sand castles — don’t forget the camera! This toy isn’t only the best toy to learn the animals’ names and sounds. It also teaches your little one how to care for animals, including a chicken, cow, and more. The farmer character might play the main role in your little one’s stories. 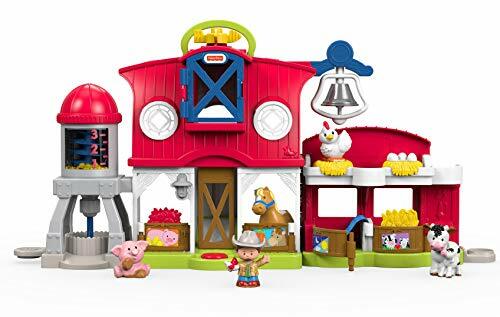 At the push of a button, songs, sounds, and lights make this farm interactive and easy to use for the youngest ones. Play accessories, such as a horse blanket, food for each animal, and a discovery button for egg hatching, will all make the roleplay more realistic. This personalized name puzzle can become a treasured keepsake when your child outgrows it. Creating memories, it introduces your kid to spelling in a personal way. The bright and colorful letters are easy to grab by the smallest hands. As your toddler grows and becomes old enough to handle more complicated puzzles, this makes a great decorative accessory in a child’s bedroom. Made with high-quality wood and safe, non-toxic paint, this makes a delightful personalized gift. Plastic toys are great, but often don’t survive long. Looking for a sturdy wooden toy that’s able to withstand rough play, and maybe survive a few more years? 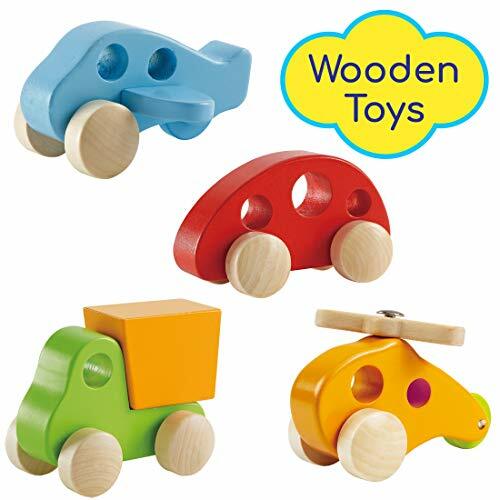 These four wooden vehicles come already assembled and without any small pieces. They’re made of non-toxic paint for worry-free play time. A helicopter, plane, car, and truck will make transportation roleplay happen, in the air and on the ground. Each painted in a vibrant hue, this might be the perfect occasion to teach your 1-year-old colors. 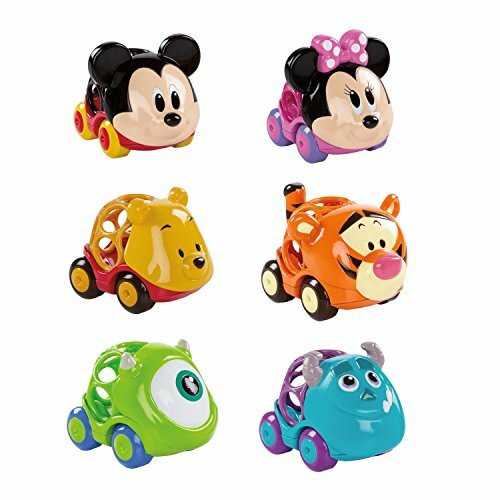 These six Disney gripper cars are conceived using the “Oball” design. This consists of hollow grooves carved out of the side, which can be easily grabbed by little fingers. Pooh, Tigger, Mickey, Minnie, Sully, and Mike are ready and waiting. Combining a strong grip with popular characters, you might want to establish a speed limit. These adorable characters can be easily taken on the road and could become the start of a themed collection. Montessori toys are designed to teach one skill at a time, encouraging independent play. They normally represent real-life objects and are made of natural and safe materials, usually wood. This house has everything Montessori aims for. 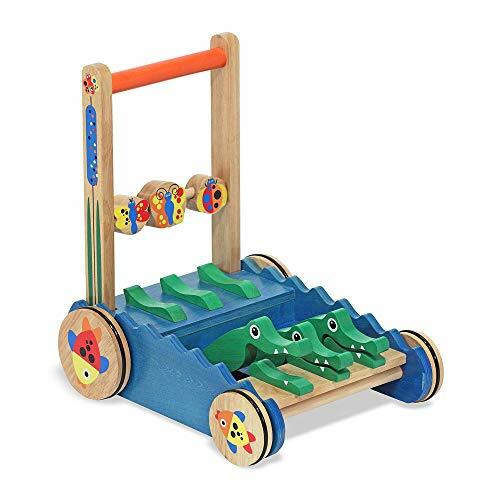 Made of high-quality wood, this ball and hammer play unit should withstand years of pounding. The toy’s concept is simple. It develops matching skills, coordination, and more. Made of non-toxic, water-based paint, and rounded shapes, it can be safely used independently and without parental supervision. You might be hesitant to let your child go to town with paints, but hold up a moment. 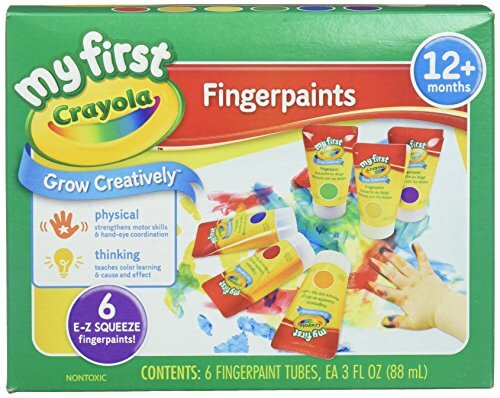 This washable fingerpaint set is ideal to encourage your child’s curiosity and creativity. With a little planning ahead of time, it may not be the nightmare you’re imagining. Six paint tubes are included — green, orange, red, blue, yellow, and purple. To get more paint out, they’re easily squeezable, even by the smallest hands. Non-toxic, your little one will be able to paint safely, setting their imagination free. Most kids love summer time. For parents, our role in keeping our children busy gets slightly more challenging. This multi-functional sports center allows your child to choose between basketball, soccer, or even bowling. It teaches numbers, shapes, how to follow directions and more. Each sport comes with its own ball. An interactive scoreboard contains three modes — move, learn, and games — producing 75 sentences and sounds. It also indicates the number of goals, keeping your toddler engaged as he or she scores. 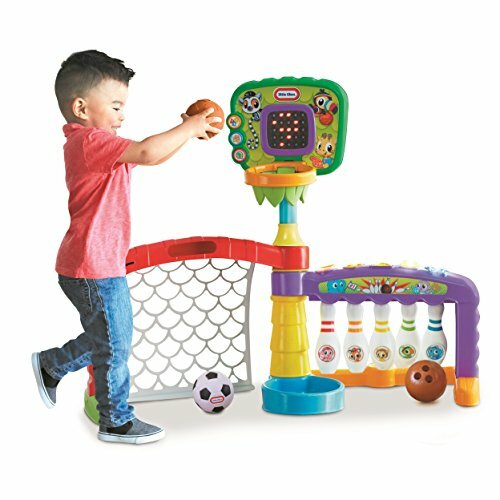 The basketball hoop is adjustable in height, so it should grow with your child. Last but not least, the unit is foldable in case you need to free up some space. Toys for 1-year-olds are plentiful, however, each may carry a different purpose. I hope this list of the best on the market has been informative for you. Whatever milestone you’re looking to develop, we guarantee there’s a toy for it. When my toddler was in a dinosaur phase, choosing the Prextex dinosaur volcano house would be a promised hit. I love that it can be carried easily, and pairs well with hide and seek. The dinosaurs are soft and cuddly, making them all the more appreciated. Which toy is your child’s favorite? Is there a particular toy on our list that you would purchase for your 1-year-old? Please leave us your comments in the section below. And if you know anyone who is looking for a toy for a 1-year-old, please share our list.